The Maremma Sheepdog is derived from the ancient shepherd dogs used in the Maremma and Abruzzes regions of Italy. At one time the dogs from these two regions were considered two different breeds, but since about 1860 they have been crossed to the point that they are now recognized as one breed. 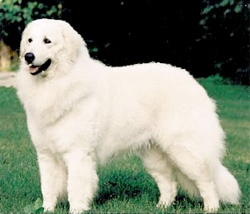 The Maremma Sheepdog was recognized by the United Kennel Club July 1, 2006. The Maremma Sheepdog is a big, strongly built dog of majestic and rather rustic appearance. He is heavily built, and slightly longer than tall in proportion. The principle function of this breed is as a flock and property guard. He is perceptive and assertive and devoted to his master. The head is large, flat and conical in shape, resembling a Polar Bear. The skull is broad and slightly convex in profile. There is a very slight stop, and the occipital crest is just barely visible. The planes of the skull and muzzle are slightly divergent. The muzzle is just slightly shorter than the skull. It is broad and deep at the corner of the lips, narrowing slightly towards the end. The lips are tight and not pendulous. The lower line of the foreface is defined by the bottom jaw, not the lips. The Maremma Sheepdog has a complete set of evenly spaced, white teeth meeting in a scissors bite. Rather large, with well opened nostrils. Black in color. Not large, almond shaped, and ochre or chestnut brown in color. The eye rims are black, and the expression is lively and attentive. Disqualification: Wall eyes. Complete lack of pigment of the eye rims. Set very high, triangular in shape, hanging but very mobile. Small in relation to the size of the dog. Cropped ears are acceptable only in dogs that are actually used in herd guarding capacity. Always shorter than the head, thick and strong, arched at the crest and free from dewlap. Shoulder blades are long, well laid back, and capable of free movement. The upper arm joins the shoulder blade at an angle that varies from 105 to 120 degrees. The elbows are held close to the chest, and are covered with soft, loose skin. The length of the forelegs is slightly greater than half the height at the withers. The legs are straight and heavily boned. The pasterns are lean and slightly sloping. The chest is deep and well rounded. The ribs are long and well sprung. The withers are high and wide. The topline is level to the croup, which is sloping. The loin is fairly long and very broad. There is little tuck up. The angulation of the pelvis and upper thigh is approximately 100 degrees. The limbs are straight when seen from behind or in profile. The upper thigh is long, with protruding muscles. There is moderate angulation at the stifle joint. The hock joint is thick and moderately angulated. The rear pasterns are strong, lean and broad. Large, with close toes. The front feet are roundish; the rear feet are more oval. Black nails are preferred. The tail is low set due to the slope of the croup. In repose, it is hanging. When the dog is in action, it is carried level with the topline with a hook in the end. The tail is well furnished but not fringed. Serious Fault: Tail curled over the back. Disqualification: Docked or natural bob tail. Somewhat long, harsh, straight, and held close to the body. A slight wave is tolerated. The hair forms a collar around the neck, and limited fringing on the back of the thighs. The hair is short on the face, ears and front of the legs. On the body, it may be up to three inches in length. The undercoat is seasonal. The skin is tight and thick, with black pigmentation of the mucous membranes as well as the third eyelids and toe pads. Solid white. Shades of pale ivory, orange or lemon are tolerated but not to extremes. Disqualification: Solid Isabella color or Isabella patches. Black shading in coat. Acceptable height range for males is 25.5 to 28.75 inches. For females it is 23.5 to 26.5 inches. Weight ranges from 77 to 100 pounds for males; 66 to 88 pounds for females. Serious Faults: Over or under the size limits. Solid Isabella color or Isabella patches. Docked or natural bob tail. Complete lack of pigment of the eye rims.